Eastfield Inn is an ideal destination to catch up with friends while enjoying a traditional British dish. Choose a drink from the well stocked bar and soak up the relaxing atmosphere. "We are an award winning family friendly pub situated on Henleaze Road, Bristol. Back in 2013, the pub underwent a full refurbishment, turning it from a once unloved building into a modern, friendly and comfortable local. 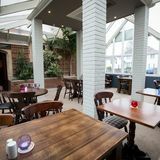 With our huge family friendly garden (complete with a children's play area, some lovely fluffy rabbits and garden games for hire), comfy bar area, large restaurant, sunny conservatory and family room equipped with soft play, there's something for everyone here. We serve delicous food and a wide range of drinks; 6 cask marque standard real ales, a lovely selection of wines, spirits, bottled drinks, draft lagers and ciders, alongside plenty of soft and child friendly drinks. We're open from 9.30am Monday-Friday, serving coffee and cakes in the main pub and hosting the very popular 'Happy Hands & Twinkley Toes' toddler class in the Family Room. Food is served from 11am Monday to Saturday, and our superb roasts are available each Sunday from 12noon. We're passionate about the food we serve and where it comes from. Have a look at the 'Food' section of the website for our current menus and for more information about our suppliers. We regularly host events and private functions, from children's parties, to BBQs and Wedding receptions. See the 'Food' section for our party menus. " we also have a children soft play area with a giant inflatable soft play, free of charge to use! 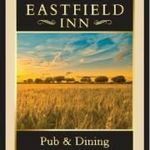 What did you think of Eastfield Inn? By Anthony N R S.
Until last year I lived in Bristol quite near to this pub, and I used it regularly until around 2008 when the lack of service became intolerable - doubtless a reflection of the uncertainty about ownership and management. Back in the early 2000s this was an established local institution with regular drinking and dining customers - but these seem to have been alienated over the years. This pub has tremendous potential, with two large bars, a conservatory and a very large beer garden. If it was in stable management, with a consistent quality of food and drink, it should prove extremely popular. There is very little competition until you get to Westbury - the Westbury Park Tavern was a morgue when i last used it, and the Beehive has closed so I understand. The Eastfield needs good managers to revitalise it, and save it from ending up being converted to flats or an old peoples' home. So good luck to anyone think of taking it over! stevie, hi, i dissagree with your two comments, the food was gorgeous!.. the staff took great time and effort to talk to you and make you feel welcome. i also have to add the eastfield in when the new owners jan and gez took over was turned around and was a great place and enviroment to be in! now they have left i feel that it is like a morgue and has no sole like its twin brother up the road! Food reasonably priced and not bad. The only down fall was the barstaff, slow and too busy talking. 20 destinations curated by View .